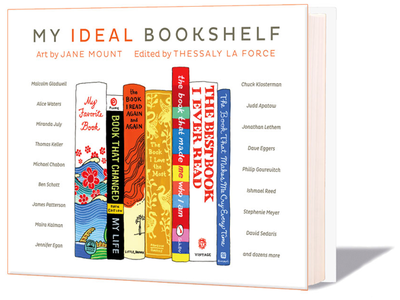 In our 2011 holiday gift guide for book lovers, we were proud to feature the Ideal Bookshelf poster. This year, we’re happy to see that that project became its very own book of the same name, edited by Thessaly La Force with art by Jane Mount (Little, Brown and Co.; $24.99). Casting a wide net out to novelists, artists, designers, chefs, filmmakers, and journalists, the duo asked contributors to create a shelf of books that they could not live without, that had changed their lives as readers. Jane Mount then illustrated the list of books in her charming, colorful way. I am often tempted to flip through coffeetable books without quite reading them, which would have been a shame in this case. Stopping not only to read the brief essays by people like Chuck Klosterman, Drew Gilpin Faust, and Tony Hawk, but to ‘shelf-read,’ their collections offers flares of insight into modern reading and book owning. Did anyone else know that Johnny Cash loved old books? Rosanne Cash remembers one treasure: “My dad would get so anxious if anybody held it, if anybody touched it. He loved books more than anything.” Her shelf was heavy on literature. I loved finding Steinberg’s Five Hundred Years of Printing on the shelf of Penguin Books cover designer Coralie Bickford-Smith. Look closely and you’ll spy Graham Greene, Tobias Wolff, Nabokov on many a shelf; Edith Wharton, too. I was surprised to see her so often. Needless to say, it is a perfect gift for the book lover in your life. The very last page of the book is a blank ideal bookshelf, beckoning readers to fill it in for themselves. I, for one, could not resist, and so here it is: H.D. Thoreau’s Walden; J.M. Coetzee’s The Life and Times of Michael K; Margaret Mitchell’s Gone With The Wind; Edith Wharton’s The Age of Innocence; Tim O’Brien’s The Things They Carried; John Carter’s ABC for Book Collectors; Mark Helprin’s A Winter’s Tale; Nicholson Baker’s Double Fold; The Portable Dorothy Parker; A.S. Byatt’s Possession; John Fowles’ The French Lieutenant’s Woman; David Mitchell’s Black Swan Green. In our 2011 holiday gift guide for book lovers, we were proud to feature the Ideal Bookshelf poster. This year, we're happy to see that that project became its very own book of the same name, edited by Thessaly La Force with art by Jane Mount (Little, Brown and Co.; $24.99). I am often tempted to flip through coffeetable books without quite reading them, which would have been a shame in this case. Stopping not only to read the brief essays by people like Chuck Klosterman, Drew Gilpin Faust, and Tony Hawk, but to 'shelf-read,' their collections offers flares of insight into modern reading and book owning. Did anyone else know that Johnny Cash loved old books? Rosanne Cash remembers one treasure: "My dad would get so anxious if anybody held it, if anybody touched it. He loved books more than anything." Her shelf was heavy on literature. I loved finding Steinberg's Five Hundred Years of Printing on the shelf of Penguin Books cover designer Coralie Bickford-Smith. Look closely and you'll spy Graham Greene, Tobias Wolff, Nabokov on many a shelf; Edith Wharton, too. I was surprised to see her so often. Needless to say, it is a perfect gift for the book lover in your life. The very last page of the book is a blank ideal bookshelf, beckoning readers to fill it in for themselves. I, for one, could not resist, and so here it is: H.D. Thoreau's Walden; J.M. Coetzee's The Life and Times of Michael K; Margaret Mitchell's Gone With The Wind; Edith Wharton's The Age of Innocence; Tim O'Brien's The Things They Carried; John Carter's ABC for Book Collectors; Mark Helprin's A Winter's Tale; Nicholson Baker's Double Fold; The Portable Dorothy Parker; A.S. Byatt's Possession; John Fowles' The French Lieutenant's Woman; David Mitchell's Black Swan Green.